In the industry, 8-way hand tied coil springs are the gold standard of quality in sofas and easy chairs. Our team has have heard about it, but we tend to purchase other seating because of lower purchase cost and a sales person’s claim that the coil springs have no advantage over other seating support. At the opposite end of seating comfort, are wooden bleacher seats. It does not take long for extreme discomfort to start, causing squirming and trips to the concession stand. This is because planks are not designed for human comfort. On a comfort rating, flat or “no sag” springs are in between a hard board and coil springs. They were developed following WWII, with goals of greater production and lower consumer cost. Most flat spring chairs have 5 or 6 springs per seat, while frames with coil springs have 9. It is not very difficult someone to press down on a single flat spring until it bottoms out, leaving the seat cushion on a type of plank. The 8-way hand tied coil spring seat distributes a person’s weight over more springs than the flat springs, creating much greater resistance to bottoming out. The other comfort benefit of coil springs is the soft front edge. Flat spring installation is called a hard edge. As someone is sitting down, the flat springs compress lower that the front rail, so a person feels the front rail, becoming uncomfortable after a while. The top of coil springs are above the front rail, and with their greater resiliency, significantly reduces the possibility of the back legs weighing down on the rail, eliminating the hard frame pressing into the back of the legs. Flat spring frames are typically less durable, usually ¾” thick, sometimes made with plywood, particleboard, or less desirable lumber, making them easier to fail within a few years of use. Coil spring chair frames are of hardwood, 1′ thick or more greatly out live the flat spring frames. This premium seating construction is not for all consumers. There is a wide variety of chair styles that will not accommodate coil springs. 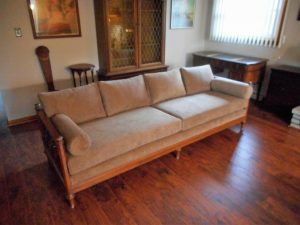 There are consumers not needing long lasting heavy-duty sofas. However, for those that want the best in sofas and easy chairs, the 8-way hand tie coil spring construction, having passed the test of time, is the gold standard to measure by.